There are ten persons namely P, Q, R, S, T, U, V, W, X and Y. They got appointments on 14th and 19th of different months i.e. January, March, April, June and July but not necessarily in the same order. V got an appointment in the month which have odd number of days but not in January. Four persons got appointment between V and W. T did not get appointment on an even date. X got an appointment in the month which has odd numbers of days. V got appointment before W. Only two persons got an appointment between X and Y. S got an appointment on an even date of the month which has even number of days after T. P got an appointment just before T. U got an appointment just after R but not in April and January. Only three persons got an appointment between Q and U. T and U got appointment on the same date but different months. Q1. Who among the following got appointment in the month which has less than 31 days? (i)- By using these conditions, V got an appointment of the month which have odd number of days but not in January. V got appointment before W. Four persons got appointment between V and W. There are two possible cases. U got an appointment just after R but not in April and January. T and U got appointment in the same date but different months. That means U got appointment on 19th of the any month. T did not get appointment on an even date. 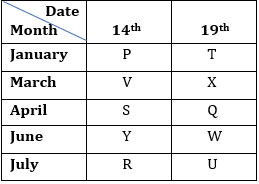 (ii)- S got an appointment on an even date of the month which have even number of days after T. P got an appointment just before T. That means S got appointment either on 14th April or 14th June. P and T got appointment either in January or April in Case-1. In Case-2: S got an appointment on 14th April and P and T got Appointment in January. Only three persons got an appointment between Q and U. By using this condition case-2 will be eliminated. X got an appointment in the month which have odd numbers of days. Only two persons got an appointment between X and Y.
Q2. Four of the following five are alike in a certain way and hence they form a group. Which one of the following does not belong to that group? Q3. Who among the following are the persons who got appointment on the first and the last day? Q4. How many persons got appointment between V and W? Q5. Who among the following got appointment on 19th June? Q6. If “control relief money” is written as “ *5@ #5$ &3# ”. What will be the code for “money power Peak”? Q7. What will be the code for “Peak”? Q8. 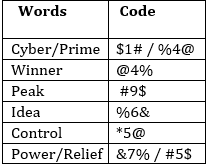 If “cyber power peak” is written as “ #9$ &7% $1# ”. What will be the code of “power cyber tax”? Q9. What will be the code of “cyber”? Q10. What will be the code of “winner”? Q11. How many pairs of letters are there in the word “SUPERTECH” each of which have as many letters between them (in both forward and backward direction) in the word as they have between them in the English alphabetical series? 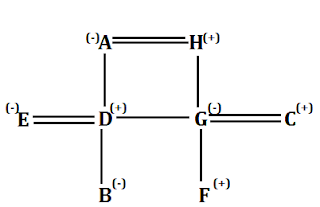 There are eight members- A, B, C, D, E, F, G and H in a family. There are three married couple and three generation in this family. H has only 2 children. D is son of A and husband of E. F is the nephew of D. G is the aunt of E’s daughter. A is the grandmother F. C is son-in-law of H.
Q12. How is C related to E? Q13. How is B related to G’s son? Point P is north east of point R, which 12 is east of point K. Point O is 8m south of Point U which is north of Point R. Distance between K and U is 13m. D is 4m east of point O.
Q14. 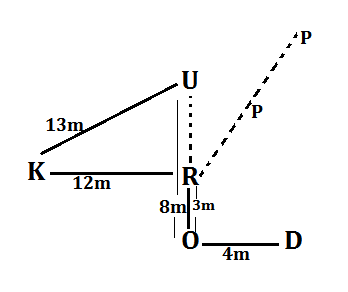 Point P is in which direction with respect to point U? Q15. What is the shortest distance between point R and D?